CLICK HERE to view enlargements and notes for the images below. 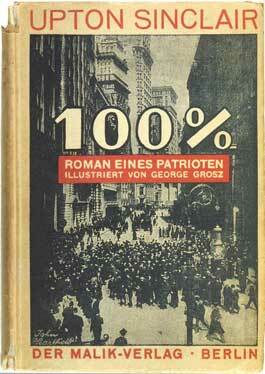 Many Malik-Verlag customers bought books only to have the John Heartfield dust covers. 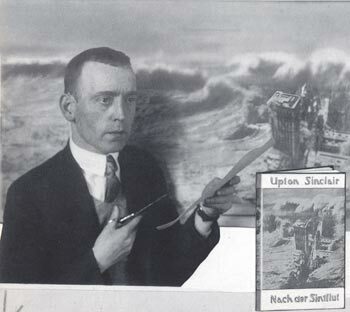 Heartfield turned down lucative offers from some of Berlin’s largest ad agencies so as to pursue his own vision. Heartfield brilliantly played off the themes in Kurt Tucholsky’s Deutschland, Deutschland, uber alles. 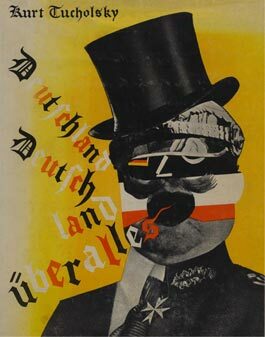 Tucholsky’s skewering of German society, illustrated with John Heartfield’s Dada art graphics, was an enormous success. John Heartfield Book Covers is an expanding collection of the book dust covers Heartfield created for his publishing house Malik-Verlag and others. It was observed that many books were purchased simply because of Heartfield’s covers, not for the book’s content. John Heartfield Book Graphic Design is a growing collection of the graphic designs that graced book interiors. Upton Sinclair was initially reluctant to use the fiery Heartfield, but he was won over by his talent. Dada served John Heartfield well in his role as a graphic designer at Malik-Verlag, the publishing house where he served as the creative partner with his brother, Wieland Herzfeld. Heartfield employed typography as a artistic element. He was the first book cover designer who presented the book jackets as 3-D designs that told a story from the front of the book to the back. (See excerpt from Nancy Roth’s article below). 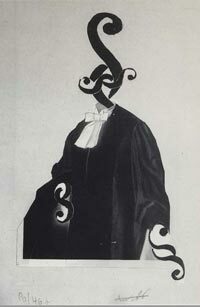 Some graphics had images that resembled musical notes placed on the head of a judge’s robe. These images, like a great deal of Dada art, appeared to have no rhyme or reason. Others Heartfield covers were clear statements to enhance messages in books. John Heartfield’s graphics for book dust jackets and interiors made him one of the most sought after designers in Berlin. His collaboration with Kurt Tucholsky, Deutschland, Deutschland, Über Alles, was an enormous success. He was offered high-level high-paying positions in German advertising agencies. He turned them all down. He said working for the agencies would interfere with his ability to freely express himself. New works for Heartfield Book Graphics will constantly be added. Please join our social networks for important updates.